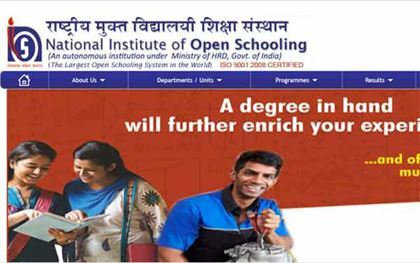 The NIOS - National Institute of Open Schooling is one of the three National Boards of secondary Education and offers school education through ODL- Open and Distance Learning Mode. It is the largest open school in the world with the largest number of courses available, supported by Print and electronic media. It has been vested with the authority to enrol, examine and certify learners upto pre degree level. The courses of study of NIOS have the same standard and equivalence as the courses of study of other national/state level boards of school education. Students have joined colleges and professional institutions after completing their studies from NIOS. NIOS develops its own curriculum, self learning material, and media support programmes utilizing, expertise of faculty from various academic and vocational educational institutions and organizations. National Boards; the other two Boards are (i) the Central Board of Secondary Education (CBSE) and (ii) the Council for Indian School Certificate Examination (CISCE). Learner can take admission Online under various streams or through Study Centre, Facilitation Centre, Regional Centre for the Secondary and the Senior Secondary Education Courses. The Public Examinations are held twice in a year. Nine examination chances are offered to a learner in five years. A learner can take any examination during this period as and when he/she is well prepared and can avail the facility of credit accumulation. A learner can also appear under the On-Demand Examination System (ODES) of NIOS at the Secondary and the Senior Secondary levels at the NIOS Headquarter, NOIDA at the Regional Centres of NIOS, and at 43 Kendriya Vidyalayas across India. A learner is eligible for On Demand Examination after first public examination. Click here or more Distance Education.